How to schedule an Backup Task? Aomei Backupper has scheduling capabilities built in and you can configure an scheduled backup without manually perfoming a backup task so Aomei Backupper will run it as scheduled. AOMEI Backupper is able to back up data for you automatically and periodically at a regular basis, which can enhance data security to a large extent. AOMEI Backupper provides four schedule modes: Daily, Weekly, Monthly, Event triggers to backup system, applications, and personal files and so on. For instance, you can schedule backup Windows 7 to back up OS. With these modes, you can run different scheduled tasks to back up system, applications, and personal files, etc. 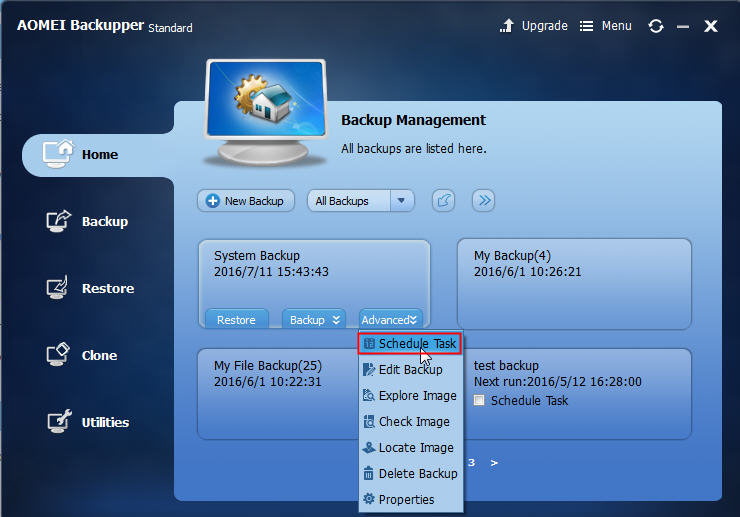 How to create a scheduled Backup task for your system ? Method 1: If you have not created any system backup task, click "Backup", select" System Backup" so it will jump to "System Backup" interface. For System Backup, Aomei Backupper will list partitions that are related to system to boot automatically and you can see "Schedule" option on "System Backup" interface. Method 2: If you have created an system backup task but you have not enabled "Schedule"feature, you can enable it under "Advanced" button. Set a time point in the future to perform the backup task only once. Set a time point to perform the backup task once a day. Set a time frame in a day first, then choose time interval between start time and finish time and program will perform the backup at intervals of 1, 2, 3, 4 or 6 hours within this time frame every day. 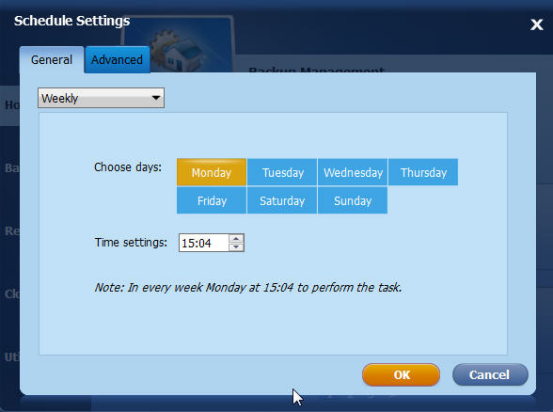 Choose specific day for the backup task from Monday to Sunday. 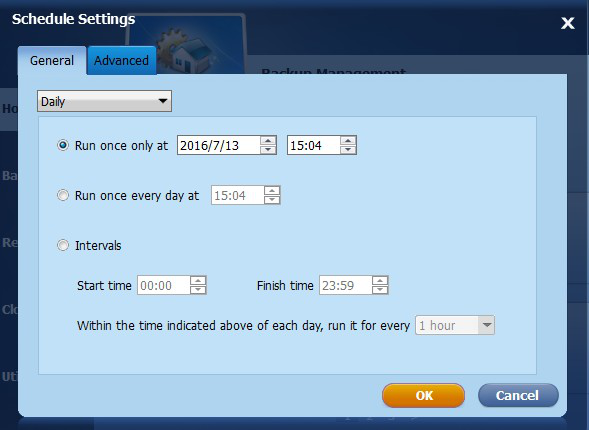 Set a time point and the program will automatically perform the backup at a given time point on the chosen day(s) every week. Choose a time point on specific day(Monday-Sunday) of each month to perform backup task. 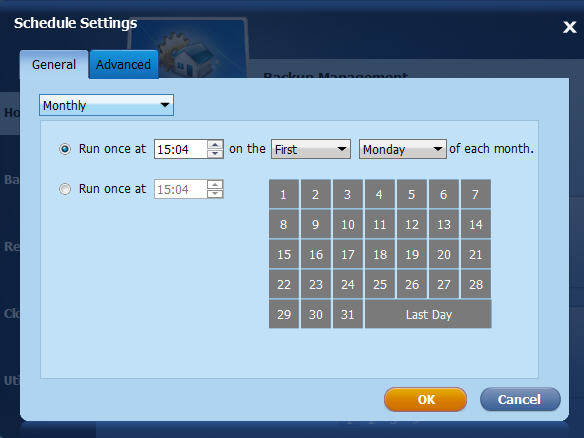 Choose a time point on specific day from the calendar to perform the backup task every month and you can select multiple days on the calendar. There are four event trigger types offered by AOMEI Backupper: User logon, User logoff, System startup and System shutdown. Please noted that Event triggers mode is available in paid versions only, like AOMEI Backupper Professional. Please upgrade to professional if necessary. For more detailed info about how "Event triggers" works, please see Windows backup on logoff. 1. User logon: Set up to perform backup automatically when user is logged on. Once you log on any user account (administrator or standard), the backup task is performed immediately. If you log on an administrator account, you can see a small tray of AOMEI Backupper which shows the backup progress in the right bottom corner of the desktop. But, if it is a standard account, the backup task is performed in system background without the visible small tray of AOMEI Backupper in the right bottom corner of the desktop . 2. User logoff: Set up to perform backup automatically when user is logged off. Once you log off any user account (administrator or standard), the backup task is performed in background immediately. If the backup has not completed after you log on a account again, it still continues to run. If you log on an administrator account, you can see a small tray of AOMEI Backupper which shows the backup progress. If you shut down pc before the backup has not completed, AOMEI Backupper will prevent system from shutting down and then continue to complete the backup first. After that, the system will turn off automatically after the backup is completed. 3. System startup: Set up to perform backup automatically when system start up. Once the system start up, even though you have not logged on an account to enter in the desktop, the backup task will run in background immediately. If the backup hasn't completed after you enter into the desktop, it will still continues to run and you can see a small tray of AOMEI Backupper which shows the backup progress after you enter into the desktop though an administrator account. If you shut down pc before the backup is complete, AOMEI Backupper will prevent system from shutting down and then continue to complete the backup first. After that, the system will turn off automatically after the backup is complete. 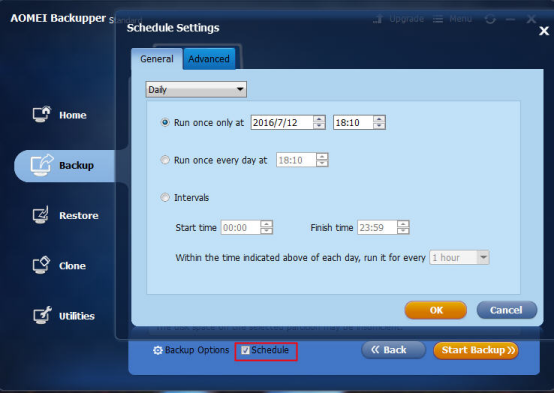 In addition, you can set time to delay performing the backup task. For instance, you set up 5 minutes, so the backup task starts to run after 5 minutes when the system start up. 4. System shutdown: Set up to perform backup automatically when system shut down. When you click “shut down”, AOMEI Backupper will prevent system from shutting down to perform the backup first and you can see the information on screen. If the backup data is a little bit large, it will stay longer here. After that, the system will turn off automatically after the backup is complete. Please noted that if system update is running after clicking "shut down", the backup will run after the system update has completed. If you want to disable your scheduled backup task, Go Home > Advanced > Schedule Task > Do not schedule to cancel it. For Event triggers feature, Aomei Backupper standard version does not support it and if you want to use this feature, you need to purchase our paid version. If you tick “Run one time every day”in the bottom-left corner, the backup task will run only one time in a day. In this situation, if the program detect the backup task has performed, it will not run again in a day.